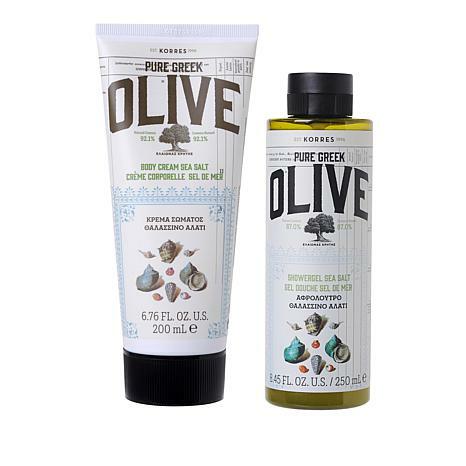 High-quality olive oil extracted from the silver-green olive groves of Crete is incorporated into these Korres Olive Oil and Sea Salt cosmetic formulations. The body cream nourishes skin with moisture, rejuvenating and softening it, while the shower gel gently cleanses. Ingredients: Aqua/Water/Eau, Caprylic/Capric Triglyceride, Glycerin, Prunus Amygdalus Dulcis (Sweet Almond) Oil, Hydrogenated Polydecene, Glyceryl Stearate Citrate, Ammonium Acryloyldimethyltaurate/VP Copolymer, Butyrospermum Parkii (Shea Butter), Decyl Cocoate, Parfum (Fragrance), Aloe Barbadensis Leaf Juice, Althaea Officinalis Root Extract, Caprylyl Glycol, Citral, Citronellol, Distarch Phosphate, Geraniol, Glycine Soja (Soybean) Oil, Lactic Acid, Limonene, Linalool, Magnesium PCA, Manganese PCA, Olea Europaea (Olive) Fruit Oil, Olea Europaea (Olive) Leaf Extract, Panthenol, Phenoxyethanol, Potassium Sorbate, Rosmarinus Officinalis (Rosemary) Leaf Extract, Sodium Benzoate, Sodium Gluceptate, Sodium PCA, Zinc PCA. Ingredients: Aqua/Water/Eau, Sodium Laureth Sulfate, Cocamidopropyl Betaine, Sodium Cocoyl Isethionate, Parfum/Fragrance, Coco-glucoside, Glyceryl Oleate, Aloe Barbadensis Leaf Juice, Arginine, Benzyl Alcohol, Benzyl Salicylate, Castoryl Maleate, Glycerin, Guar Hydroxypropyltrimonium Chloride, Hydrolyzed Wheat Gluten, Imidazolidinyl Urea, Lactic Acid, Limonene, Olea Europaea Olive Leaf Extract, Phenoxyethanol, Polyquaternium 7, Potassium Sorbate, Sodium Benzoate, Sodium Chloride, Sodium Dehydroacetate, Sodium Gluconate, Tocopherol. This is wonderful, I have allergies and can't stand strong smells, but I love this, it's a very soft smell, you just get a nice whif with it but still get the moisture in my skin that is needed. 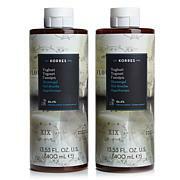 Thank you Korres! Love this product. Smells clean not floral. Olive oil is so good for you to eat and on your body. My new favorite duo. Started with the hand cream and loved so much I went back and bought the body duo. Body cream not greasy and makes my skin feel silky. Body wash smells so clean. This is my second order of this duo. I love the clean fresh fragrance and especially love the way my skin feels after using it. My elbows and knees have never been so soft! This product penetrates and softens so well my skin feels like a babies skin.Love it!! This smell was not horrible but not great either. Not as moisturizing as I had hoped also felt a little sticky on skin, not a whole lot but did not care for it at all.